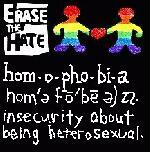 Because I don’t agree with Homosexuality doesn’t mean I’m Homophobic! The e-mail was written by one of those pseudo-white supremacists who feels the need to rant and rage against American’s societal ails. It was that last rant that got me to thinking: “I think that if you feel homosexuality is wrong, it’s not a phobia, it’s an opinion.” At first I chalked the tirade up to one of those super-ignorant persons and left it at that. But that line on homosexuality kept gnawing at me. But why? Why did this bother me so? People say this all the time, so why would it be different now? As I thought it through though, I began to understand what it was about this e-mail that was bugging me. First off, the e-mail in itself was so obnoxious that I wanted to tie down the writer and pull out every one of his nose hairs one-by-one: but the other reason was much less reactionary. It was his idea that homosexuality was an opinion… versus science. And that’s when I realized that this may be the real problem gay men and women are facing right now worldwide. You see, this line of thinking is very similar to saying “just because I don’t believe in evolution doesn’t make me anti-science,” when n reality; it does. The challenge that the gay community is facing is based not on science, but on “opinion…” There are a lot of people out there who feel that homosexuality is an abomination, that it is wrong, that it is evil, that it is condemned by the Bible, that it is a free elevator ticked straight (no pun intended) down to hell. We in the gay community call that “fear,” “hatred,” “self-righteousness,” “superstition,” and a whole bunch of other names. We like to think that we live in a scientific age, but for many groups this is just too big of a step to take just yet. Science has changed the way we see the world in just about every way. When the Bible was first written, there was no Internet, there were no history books for research, and most of the people (about 97%) were illiterate. We had no satellites, no maps, no telescopes, no GPS systems and no science or biology books. All that was known of the Universe was based upon what we “saw.” Therefore the world was flat, the sky was blue, the sun moved around the Earth, the stars “came out” at night and went down during the day and natural disasters were an angry God. A chariot carried the sun across the sky, and the Earth was really only a few miles from one side to the other and anyone adventurous enough could reach the end of the world if they packed a week’s worth of supplies. That was the context, the mentality when the Bible was written. And that doesn’t mean these people were stupid, but let’s face it; they didn’t have the technology we have. They did not have the understanding of the world the way we have now (and let’s face it, many years from now our generation will look to same to generations ahead of us). Everything they knew had been handed down in stories and legends. And by the time Jesus and Paul came along, those beliefs still permeated. When Jesus was taken up into heaven, they didn’t think he was actually going that far away. They thought that heaven was just above the clouds. They also thought that the stars were places in heaven where angles were looking down on them. If you truly think about it, if Jesus traveled at the speed of light when he was taken from the earth, he wouldn’t even be out of our Universe yet. That means he’s no sooner going to get to “heaven” and then he’s going to have to turn around and come back again. So I think it’s safe to assume he’s not going to come back for at least another 2,000 years. But these were not “realities” known to Paul and the authors of the New Testament. So it was assumed that Jesus was simply taken to that place “above the clouds” (and I’ve been there many times on flights across the country and round the world, and I haven’t seen him or anyone else up there yet). It was also in this context that the creation myth was formulated (when I use the term myth, I use it in it’s original/true meaning: 1. a usually traditional story of ostensibly historical events that serves to unfold part of the world view of a people or explain a practice, belief, or natural phenomenon: 2 a popular belief or tradition that has grown up around something or someone; especially one embodying the ideals and institutions of a society or segment of society—Miriam Webster). So in many versions of the creation myth a force outside of the world/Universe “created” this Universe; and in the final biblical version God completed the task in seven days. But slowly, throughout the middle ages, this perception began to change. Galileo one day decided that the sun didn’t revolve around the Earth, but that the Earth revolved around the sun. And his reward for this incredible discovery was imprisonment by the church for heresy. In the 1800s, Charles Darwin spent five years aboard the Beagle as a naturalist studying life species around the world, and particularly in the south Pacific and wrote about it in “The Origin of the Species,” where he deduced that all life “evolved…” that all species evolved from other simpler forms of life. Since this discovery, the church has fought tooth-and-nail to suppress it. It has even gone so far as to try and create “science” that will refute it (at one time called Creationism, but now being called Intelligent Design). And the science continues to emerge. The pictures from Hubble, the discovery of Lucy, and just this year, the discovery of the arctic fish—fossils of a 375 million-year-old fish never seen before, and which scientists are calling the "missing link" in the evolution of some fishes from water to a life walking on four limbs on land. These are just some of the things that have challenged our worldview and have left creationist frightened and struggling to protect their belief at all costs. And we as a culture are left with the challenge of how we are going to handle this constantly changing challenge to our own worldview. All this brings me back to my original point. The writer of the e-mail wrote, “I think that if you feel homosexuality is wrong, it is not a phobia, it is an opinion.” Well, Science is also changing how we view sexuality—including homosexuality. We still don’t know for sure where it comes from or why it’s here but we now know that it’s biological. It has shown up in humanity throughout our history, and it expresses itself in thousands of other species of life as well (although only humans seem to have a “preference” of one over the other). Another challenge facing scientists is, “why is it here.” The way evolution works is that if something doesn’t work, evolution changes it. But there’s no change here. Homosexuality continues to affect ten to twelve percent of the population, and it continues to cross boundaries, political and religious beliefs, ethnicities and class. In other words, it remains unchanged. If anything, it could in fact be growing. So from an evolutionary point of view, it must be serving a purpose. Now I don’t pretend to know what that purpose is, but I have some ideas (or opinions if you want to go there), and one of those ideas is that it must help control the population. After all, in a world where there’s so many people all trying to inhabit the same space, Mother Nature’s got a couple of choices at her disposal. She can send a giant tsunami or another catastrophe and take us all out in one shot (which she will do if she feels it’s necessary), or she can make sure that there’s a part of the population that enjoys the company of each other without so much emphasis on procreation. So when someone says “I think that if you feel homosexuality is wrong, it is not a phobia, it is an opinion” I have to ask… “have you really thought this through?” There are really only a couple of options here… number one, you’re a bigot—why else would you “disagree” with something that nature has instituted, or number two, you’re ignorant. To say “I don’t believe in science” is pretty ignorant. After all, whether or not you believe in it doesn’t change its reality. I can say I don’t believe in gravity and then jump off the Empire State Building, but as far as gravity’s concerned, I’m going to fall… period. Now I could say “I don’t believe in gravity” and get on an airplane, and as long as everything is working on that airplane there won’t be any problems. But at some point, that plane has to come down. That law of gravity works regardless of my belief. In reality, everything this guy had to say was opinion and conjecture. But that leaves me with one last thought, and that’s how we handle opinion. Every one of us has opinions, and we’re all to excited to share them… here I am writing an opinion piece about another guys opinion piece. But how we handle opinion lately has become someone troubling. We have begun to take opinion as fact, and more importantly, we have begun to think that because it’s our opinion, it’s therefore gospel. Homosexuality is truth—how you feel about that is opinion. Gravity is truth—how you feel about that is opinion. Evolution is truth—how you feel about that is opinion. Even a lot of what’s happening in our society today is more opinion than anything. As we struggle with social issues and wars and terrorism and the other ills that are plaguing our society right now, most of what we think about it, how we respond to it, and what we say about it is purely opinion; albeit “informed” opinion. Even the Bible (which is the only reason I can think of that our writer would have any problem with homosexuality) is understood purely on “interpretation…” i.e. opinion. So I say, “Have opinions.” We all do and they’re fascinating things. But understand that it’s an opinion and nothing else. But if you can’t at least handle the realities first, then how do you expect your opinions to mean anything at all aside from some crazy rant—or as I like to call it… the bigot’s rant. Ben Tousey is an established author who left the ex-gay movement and now writes about his experiences and the fundamental flaws in reparative therapies. His most recent book My Egypt - why I left the Ex-Gay movement is his own personal acount of the time he spent in these groups and his growth and acceptance of his sexuality.